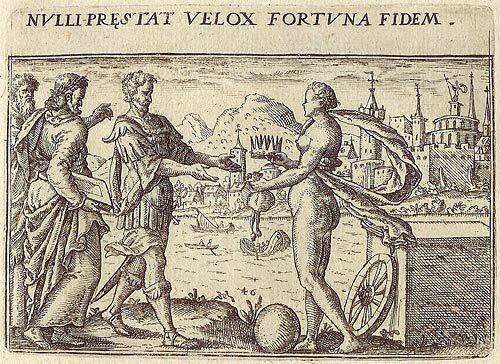 Shakespeare, like his contemporaries, makes ample use of the standard iconography of the goddess Fortuna and her wheel in his plays, although always with a twist. In As You Like It and Henry V, Shakespeare brings the traditional personification of Fortune to the stage, showing the limitations of such a worn signifier in the context of his theatre. In Othello, the playwright transforms, or “unbinds”, the ossified image of Lady Fortuna turning her wheel, using poetry and the properties of the theatre to convey the changing fortunes of the characters. The play is obsessed with the idea of Fortune from beginning to end. All the characters talk about and refer to their fortunes, but it is with Othello’s own present and past fortunes, his “wheeling” nature, and his hyper-investment in a fortunate handkerchief that Shakespeare completely transforms the goddess Fortuna and her furniture into a new semiotic system. Shakespeare, comme ses contemporains, a souvent recours à l’iconographie traditionnelle de la déesse Fortune avec sa roue, mais toujours d’une façon inédite. Dans As You Like It et Henry V, il met en scène la personnification de la Fortune, pour, justement, montrer les limites, dans un théâtre comme le sien, de cette figure galvaudée. Dans Othello, le dramaturge transforme l’image trop bien connue de la Dame Fortune en exploitant la poésie et autres éléments du théâtre pour mieux exprimer les fortunes changeantes des personnages. Othello est une pièce de théâtre tout simplement obsédée par la Fortune. Tous les personnages en parlent, constamment, mais c’est par rapport à Othello lui-même et à sa fortune, présente et passée, sa nature extravagante, et finalement son obsession hors-norme pour un mouchoir de « bonne fortune », qu’on voit comment Shakespeare métamorphose la déesse Fortuna et ses attributs en un système sémiotique nouveau. Accessoires de théâtre, charlatan, Fortune, iconographie de la Fortune, Ben Jonson, Othello, roue de la Fortune, William Shakespeare, sorcellerie, superstition, Volpone. 1In his review of Frederick Kiefer’s Fortune and Elizabethan Tragedy (1983), John M. Lyon notes that early modern dramatists “made opportunistic, eclectic, and diverse use of Fortune.”1 He argues that Kiefer “falls victim” to Shakespearean diversity and eclecticism and so fails to make coherent sense, for example, of the hash of “Fate, Fortune and human responsibility” in Romeo and Juliet.2 Other reviewers were kinder to Kiefer’s comprehensive study of Fortune, conceding the difficulty of untangling all the guises of the poetic figure of Fortune in the late sixteenth century.3 In the following essay, I will briefly examine some of Shakespeare’s multiple uses of fortune in Othello. I would like to shed light on aspects of Shakespeare’s opportunism, and his boldness in playing with and on the trope of Fortune. How is Fortune “unbound” in Othello? Shakespeare dispenses with a personified goddess, who guides “the fateful paths of ships, individuals or weapons,” 4 to create a language of fortune in order to represent Othello’s nature and that of his handkerchief, his most visible property. By your patience, Aunchient Pistol: Fortune is painted blind, with a muffler afore his eyes, to signify to you, that Fortune is blind; and she is painted also with a wheele, to signify to you, which is the moral of it, that she is turning, and inconstant, and mutability, and variation: and her foot, look you, is fixed vpon a sphericall stone, which rolls, and rolls, and rolls. In good truth, the poet makes a most excellent description of it: Fortune is an excellent moral (III.vi.30-38). 6Fluellen’s commentary joins Pistol’s imagery in its banality. Fortune’s muffler, or scarf, means fortune is blind; the wheel means that fortune is inconstant; the foot on the stone means that fortune is unstable. Fluellen concludes that Fortune “is an excellent moral”. This facetious conclusion teaches no lesson, offers no comfort, responds to no abiding question concerning Bardolph’s imminent execution. Pistol’s riposte to Fluellen’s “moral”, namely that “Fortune is Bardolph’s foe”, shows up the limits of Fluellen’s didactic moralizing. Far from providing any kind of true consolation or spiritual balm, rather than providing any kind of true philosophy, Fluellen, and the emblem tradition being mocked here, provides only potted, received wisdom. Far from offering an ordered universe within which Pistol can comprehend Bardolph’s death, Fluellen offers a rag-bag of epithets: “turning, and inconstant, and mutability, and variation”, signifying only the eternal change brought on by the unchecked turning of the wheel of fortune “which rolls, and rolls, and rolls”. 8In Othello (1603) though, such a personification of Fortune as we find described above appears nowhere. The goddess Fortuna does not even make an initial appearance before being “mocked”, whether by a Celia or in the comic confrontation between a Pistol and a Fluellen. Instead, Shakespeare unbinds the ossified iconography of Fortune to meditate anew on fate and destiny. 9The number of appearances of the word “fortune” in Othello is among the most frequent in Shakespeare’s corpus. All the main characters mention, even reflect upon their own fortunes or those of others, at times ventriloquizing contemporary arguments concerning how best to confront “the slings and arrows of outrageous fortune” (Hamlet (1601), III.i.57). Othello may be considered, as a result, a kind of meditation on fortune, dispensing with the standard personification of the blind goddess. The play opens with Roderigo already foreshadowing Othello’s fall as payment of a debt to fortune: “What a full fortune does the thicklips owe/If he can carry’t thus” (my emphasis, I.i.65-66). In other words, what a great fall inevitably awaits Othello for the material goods, the gifts of rank, glory, and felicity that Fortune has given him and which, according to her nature, she will inevitably withdraw. Yet, even as Roderigo portrays Othello as in debt to fortune, in the narrative of his own life, Othello portrays himself as a victim of fortune. He has suffered hardship, endured “battles, sieges, fortunes” (I.iii.130), meeting with “moving accidents”(134) and “disastrous chances” (135).15 Othello’s life, as he narrates it to the Venetian elders in Act I, a “round unvarnish’d tale” (90), is a kind of playbook of narrowly missed encounters with death and bad luck. That Othello should so soon be in fortune’s debt, dramatizes the rapidity with which fortune is won and lost.16 It dramatizes as well the role of envy in helping to turn the wheel of Fortune downwards. 10Compounding the obsessive focus on fortune in the first Act, Act II begins by relating Desdemona’s sea voyage to Cyprus, becoming a new emblematic set-piece, so closely was fortune associated with the wind, the sea, and shipwreck at the time. We are again briefly in the world of the first lines of The Merchant of Venice, when Salerio imagines being kept awake at night if he had ships at sea like Antonio: “Should I go to church…And not bethink me straight of dangerous rocks,/Which touching my gentle vessel’s side/Would scatter all her spices on the stream…”(I.i.29;31-33). Desdemona’s boat, carrying as rich a cargo, the “divine Desdemona” (II.i.73), manages to avoid the “guttered rocks and congregated sands” (69) to arrive safely in Cyprus. 11Cassio refers often to his fortunes: “I am desperate of my fortunes if they check me here”(II.iii.331-332) and Iago describes Cassio as plying Desdemona to “repair his fortune”(354). Desdemona herself tells Othello, in response to his repeated demand for the handkerchief, that Cassio, “[H]ath founded his good fortunes on your love” (III.iv.94). According to Roderigo in Act 1, Desdemona has tied her own fortunes to Othello and later she herself credits this story saying that her “storm of fortunes” led her to be with the Moor, consecrating her “soul and fortunes” to him (I.iii.249; 254).17 In the beginning of his doubts concerning Desdemona, Othello states that he will let her go to “prey at fortune” (III.iii.263) like a hawk cut loose. Desdemona refers to her “wretched fortune” (IV.ii.128) toward the end of the play. She notes that the song of willow expressed the fortune of her maid Barbara: “She had a song of “Willow,”/An old thing ‘twas, but it express’d her fortune” (IV.iii.28-29).18 And, finally, Emilia will state that she found the handkerchief, “by fortune” (V.ii.226). 13He warns Brabantio that dwelling on events whose outcomes cannot be changed is not only pointless, it opens the way for new “mischief”.19 He tells him, in good Stoic fashion, that “when fortune takes” the best remedy is “Patience”. Brabantio’s reaction to these apothegms or cheap consolatory “sentences” (216) is comparable to Fluellen’s: he’s having none of it: “But words are words; I never yet did hear/That a bruis’d heart was pierced through the ear” (I.iii. 218-219). Again we find Shakespeare showing the possible limits of such standard consolations that do justice, neither to a particular grief, nor to the abiding questions posed by the strokes of fortune. 20 Francis Bacon, “Of Fortune”, The Essayes or Counsels, Civill and Morall (London, 1625), p. 234. 14A little later, in the same scene, we are witness to a comparable conversation. Roderigo grieves over his own misfortune, comparable to Brabantio’s, namely the loss of his hopes for Desdemona. Iago consoles him, not with “words”, but by exhorting him to action. And this may, in fact, be precisely the “mischief” that is unleashed in the play. Iago tells Roderigo that “ ’tis in ourselves that we are thus, or thus” (my emphasis; III.ii.319-320). The meaning of “thus” here encompasses, I would argue, not only our particular nature, but also the consequences of our particular nature, namely, our place in society, our situation in life, in short, out fortunes. Iago goes on: “Our bodies are gardens, to the which our wills are gardeners…If the [beam] of our lives had not one scale of reason to poise another of sensuality, the blood and baseness of our natures would conduct us to the most prepost’rous conclusions” (320-321; 326-329). These “prepost’rous conclusions” are Roderigo’s own fortunes. Iago’s gardener may well be a version of Francis Bacon’s architect: Faber quisque fortunae suae [Every man is the architect of his own fortune].20 Roderigo’s decision to follow Iago’s advice to weed and plant his own nature, and thus change his fortunes, ironically leads him straight into Iago’s designs. Believing himself architect of his own fortune, gardening his own garden, Roderigo ends up part of Iago’s evil architectural designs for his own fortune. 15 How does this conversation between Roderigo and Iago on fortunes—or preposterous conclusions—differ from that on Fortune—or the goddess blind—between Pistol and Fluellen? In Othello, Shakespeare has introduced fortune with a resolutely small “f”. Fortunes are hatched in the brain of a conniving man such as Iago, who holds sway over the temporal fortunes of other characters for the duration of the play, all the while arguing that every man comes to his own “conclusions”. The slippage from the blind goddess, Fortune, in Henry V, to the mischief-making Iago, signals a first stage in Shakespeare’s unbinding of Fortune in Othello. In general synod take away her power! As low as the fiends! (II.ii.493-497). Of here and every where. (my emphasis, I.i.133-137). 21 Randle Cotgrave, “Extravagance”, Dictionarie of the French and English Tongues (London, 1611). 22 I have followed The Riverside Shakespeare spelling of “epithets”. 18The word “wheeling” is used here for the first and only time as an adjective in Shakespeare. It is compounded with “extravagant”. Randal Cotgrave’s 1611 English definition of the French extravagance is pertinent: “To extravagate, to roam, to range, wander, err in a humour, stray, gad in a fantastical way”.21 The epithet “wheeling” has a similar semantic consistency, describing Othello’s peripatetic travels and dramatic peripeteia. The wheel epithet, then, associates him closely with his own revolving fortunes. Iago even describes Othello’s verbal dilation as a verbal wheeling. The first thing Iago says he hates about Othello is how he “[E]vades…with a bumbast circumstance/Horribly stuff’d with epithites of war” (I.i.13-14).22 Iago hates Othello’s roundabout, evasive indirection in speech, a kind of windy grammar, a form of circumlocutory or wheeling discourse that will eventually roll, like Fortune’s hub in Hamlet, from heaven to as low as fiends, from the sublime “Othello music” to a discourse on “Goats and monkeys” (IV.i.263).23 And so Othello, wheeling through exotic countries, across boundaries, and through accidents and disasters, is intimately linked to the wandering and wheeling speech that is ultimately an image of his own changing fortunes.24 This wheeling wandering leads even to Brabantio’s accusation that Othello is a witch. For Brabantio, the Venetian, Othello, the Moor, is “a practiser/Of arts inhibited and out of warrant” (my emphasis; I.ii.78-79). He and the arts he practices are outside the law, outside legal limits, outside the sphere of what is warranted in Venice. Othello’s wheeling nature, his circumlocutory speech, and his witchcraft are all of a piece: they pinpoint who and where he is in the world. 19The wheel image appears, significantly, with respect to Desdemona, as well as to Othello. Cassio apostrophizes Desdemona when she has safely landed in Cyprus: “Hail to thee, lady! and the grace of heaven,/Before, behind thee, and on every hand/Enwheel thee round!” (II.i.85-87) Shakespeare’s only use of the word, “enwheel”, is uttered in the context of both the safe landing of Desdemona’s ship in Cyprus and the “fortunate” (II.i.61) match between Othello and Desdemona described as such by Cassio. The possible echo of Donne’s Elegy 19, “On Going to Bed” compounds with “love’s quick pants” (II.i.80) to signal the sexual nature of Desdemona’s arrival in Cyprus, but the word enwheel, I would argue, points also to something else. Desdemona may both evoke the familiar figure of Fortuna inside her wheel, and, at the same time, be a captive in the round of the wheel. In other words, to be enwheeled is to be a kind of prisoner to the wheel, even bound, like a martyr, to the breaking wheel. 20Finally, Othello’s tirade against Desdemona in Act IV, Scene I may well be connected to the turning of Fortune’s wheel. “Sir, she can turn, and turn; and yet go on /And turn again.” (IV.i..253-254). Othello’s pointed reference to the inconstancy of women echoes the habitual language referring to the fickleness of Fortune. It is precisely this conflation of Fortune’s inconstancy with that of all women that gives us the epithet for Fortune in Hamlet and elsewhere: “strumpet Fortune”. Fortune is a whore, a prostitute, turning tricks. Yet, in Othello, since Shakespeare has completely stripped the play of all references to a personification of Fortune, the “strumpet” of Hamlet becomes Desdemona herself. Lodovico’s comment immediately following Othello’s accusation that Desdemona is a version of the best “turn” in the bed is, pointedly, a classic Stoic reaction to outrageous Fortune: “Is this the noble Moor whom our full Senate /Call all in all sufficient? Is this the nature/Whom passion could not shake? whose solid virtue/The shot of accident nor dart of chance/Could neither graze nor pierce?”(264-268) Perhaps Ludovico too has sensed the spinning wheel of Fortune behind Othello’s misogynistic “turn, and turn”. In Othello, Shakespeare has not only unbound Fortune’s wheel from a personified Fortune, but has also distilled the metonymic function of the wheel into verbs such as “wheeling” and “turning”. 21In the third stage of the unbinding of the stock image of Fortune in Othello, Shakespeare invests a stage property, a piece of cloth, with all the awe and power of the goddess Fortuna. The most radical unbinding of Fortune can be seen in the transfer of its attributes into a handkerchief, whose haphazard movements through the hands of various characters represents a new version of the chaotic movements of fortune. Instead of Fortune’s wheel rolling down the hill of heaven, as in Hamlet, the handkerchief passes from hand to hand, initiating new action and motion, which in turn will lead to preposterous conclusions. 25 In Othello, ed. Honigmann, Appendix 3, p. 378. 23In Cinthio, the purloining of the handkerchief, and its subsequent displacements and apparitions, are part of the consequences of a personified Fortune conspiring with the Ensign. The Ensign sets off the chain of events, but in the economy of the novella, Fortune is introduced to show both the fatality of the Ensign’s actions, as well as the element of chance in the design. Yet, the Moor’s arrival at just the wrong moment, the secret back door, the knock, the choleric husband, has all the earmarks of the comic. This strange concatenation of tragedy and comedy finds its way into Othello, as many critics have noted. And the mixture of genres is already inherent in the wildly differing faces of the goddess Fortuna, both as (tragic) Fate and (comic) prostitute. 27 See also III.iii.290-299, the moment when Emilia does pick up the handkerchief for comparison. 24In Othello, it is Emilia who expresses the indissoluble bond between the handkerchief and Fortune when she finally narrates the trajectory of the object that Othello has so thoroughly misinterpreted, revealing to him that his “ocular proof” (III.iii.360) is, in fact, a trompe l’oeil. Othello protests: “I saw it in his hand,/It was the handkerchief, an antique token/My father gave my mother” (V.ii.215-2117). Emilia counters: “O thou dull Moor, that handkerchief thou speak’st of/I found by fortune and did give my husband” (V.ii.224-5). Here juxtaposed are two versions of the handkerchief, that of Othello and that of Emilia. For Othello, the handkerchief means something because it is an “antique token”, a gift, “[M]y father gave my mother”, which in turn became a kind of family heirloom, given by Othello to Desdemona. For Emilia, the handkerchief is something she picked up off the ground, a “trifle”(228), except that her husband had often “begg’d of me to steal’t” (229).27 Shakespeare transforms Cinthio’s Fortune conspiring with the Ensign into Othello’s personal investment in the handkerchief. The magical thinking that believes Fortune connives in Disdemona’s death, is redirected into magical thinking about a handkerchief, manipulated and handled by a human agent, a stage-prop wielded by a stage villain. Make it a darling, like your precious eye. Othello ‘Tis true; there’s magic in the web of it. 29 Ian Smith, “Othello’s Black Handkerchief, Shakespeare Quarterly, 64.1 (Spring 2013), 1-25. 28Following Desdemona’s interjections of wonder, Othello assures her: “ ‘Tis true” and “Most veritable”, adding more description to back up the veracity of his account. The handkerchief has its origins in Egypt, the origin of origins, and in the worm: worms that were hallowed, by conjurors or cunning-men, while or before “breeding” their silk. The storied Sybil in her prophetic frenzy, together with the hallowed worm, make the material; the dye, the mumia is conserved (kept fresh?) in the hearts of dead virgins. We are not told in this description how or by whom the “strawberries”, part of the design of the handkerchief, were embroidered into it (III.iii.435). The strawberries are the “work” (III.iii.296) that must be taken out precisely to hide its origins. But they are not included in Othello’s description. Is this because Sybils do not ordinarily embroider strawberries? 29Shakespeare may well be laughing up his sleeve in describing the handkerchief so, and in so doing, commenting on the bustling trade in charms, fortunes, oracles, fetishes, and relics that proliferated at the time and the medicines, salves, love-potions, help in finding lost objects provided by conjurers and village wizards, all that white witchcraft deployed to enable people to believe they could control and ensure their fortunes. Shakespeare may indeed be outdoing the most ardent of almanackers to show the superstitious nature of this handkerchief and, by extension, the magical thinking that makes the handkerchief mean much more than it does. The handkerchief, in its Egyptian fortune-telling and prophetic guise, quite efficiently and poetically represents the goddess Fortune conspiring with Iago. 31Othello’s description of the magic handkerchief resembles Volpone’s advertisement for his authentic oil. We are assured in both of a storied antiquity. We are told that both have been passed originally from a mythical figure, a god or a Sybil, to women for their use in keeping young or keeping a hold of men. The hyperbolic rhetoric, vaunting the particular powers of both the oil and the handkerchief, is oddly comparable. Yet, the comparison pretty much stops there for, in the end, the mountebank’s rhetoric is in the service of selling an anti-age cream. For Othello, on the other hand, the handkerchief is the abstract of his birth, his life, and his end. Yet, seen from another angle, from Iago’s perspective, from the perspective of the theatre, the handkerchief is truly just “a trifle” that can be put to good use because it will be believed like “proofs of holy writ” (III.iii.324) by credulous gulls. Belief in mind-readers and fortune-tellers, the power of a piece of cloth to determine fate, or a fetish object to protect a person from the dart of chance or unforeseen accidents, all speak to those superstitions that adhere to the mystery of an individual’s fortune. The handkerchief is an object lesson that mocks the superstitions associated with getting and keeping fortune, in health, wealth, love, and power. Fortune is nothing but a mere stage device, a vaudeville act, managed by a Iago, not a predestined life-span written in sibylline books or safely kept in a box or a drawer. 32And yet, the prophecies surrounding the handkerchief are proved true. The dramatic irony of the play is that while the handkerchief is simply a couple of inches of cloth, imbued with those mythical and mystical properties, it does also appear to correctly prophesy Desdemona’s fate. As we are in a tragedy, oracles are true. This is where Shakespeare conspires with the common desire to see and read signs; the desire to see events as having been predicted, and written, not happening by pure chance, the desire for a personal destiny, not a common fate that lacks rhyme or reason. For this is the desire expressed in the oracular handkerchief. The cloth attests as well to a desire for poetry, fed, so often by mythology, exoticism, and, as Jonson knew, the magical language of alchemy. The fulfilment of the handkerchief’s prophecy is Shakespeare’s sop to an audience which holds dear the idea that someone, like a mythical Fortuna, turns a wheel, or that a magical sibyl writes prophecies—anything rather than the boundless hatred represented by a Iago, for whom the handkerchief is not “holy writ”, but indeed a trifle to be trifled with, and to trifle with others. 1 John M. Lyon, Review of Fortune and Elizabethan Tragedy (1983) by Frederick Kiefer, The Modern Language Review, 82.2 (April 1987), pp. 443-444; 443. Kiefer’s book remains the most comprehensive study of fortune in the Elizabethan period. 3 See Rolf Soellner, “The Many Facets of Fortune”, Review of Fortune and Elizabethan Tragedy by Frederick Kiefer, Shakespeare Quarterly, 35.2 (Summer, 1984), pp.246-250. 4 Michael Witmore, Culture of Accidents: Unexpected Knowledges in Early Modern England, Stanford University Press, 2001, p. 23. 6 See Book II in Boethius, The Consolation of Philosophy, ed. Richard Green, New York and London, Macmillan, 1962, pp.21-22. 8 The end tympana of the Long Gallery at Little Moreton Hall have plaster figures of Fortune and Destiny copied from images in Robert Recorde’s Castle of Knowledge (London, 1556), the first astronomical treatise to be published in English. I thank Alison Findlay for drawing my attention to the images at Little Moreton Hall in Cheshire, England. 12 William Shakespeare, The Riverside Shakespeare, eds. G. Blakemore Evans et al (Boston, Houghton Mifflin Company, 1974). All quotations from Shakespeare will be to this edition. 13 For Pistol’s probable allusion here to the ballad “Fortune, my Foe! Why dost thou frown on me?” see Henry V, The Oxford Shakespeare, ed. Gary Taylor (Oxford: OUP, 1982), p. 188, n.38. Tiffany Stern, in a recent talk in Paris (May 2018), mentioned the identification of the popular tune with hanging and execution. For more on ballads, see Christopher Marsh, Music and Society in Early Modern England, (Cambridge, CUP, 2013). 14 In the same note on the allusion to the ballad, “Fortune, my Foe”, Taylor describes it as a “jingle”: p. 188, n.38. 16 We cannot be certain exactly how much time elapsed between Othello’s adventures, his narration of them to Desdemona, and his subsequent narration of them to the Venetian elders. The play, nevertheless, closely juxtaposes Iago’s hatred and Roderigo’s envy with Othello’s narration of a life of difficulty and misfortune, giving us the impression that Othello has enjoyed good rather than bad fortune quite briefly. 17 The Riverside Shakespeare uses “storm”, while the Arden 3 editor, E.A. Honigmann, uses “scorn”, noting that in the period “Both scorn and storm of fortune were commonplaces”. See Othello, The Arden Shakespeare, ed. E. A. Honigmann, Third Edition (London, 2002), p. 151, n.250. 18 Like Pistol, turning to the ballad, “Fortune, my Foe” to express Bardolph’s fortune, Desdemona turns to an “old thing” to express her own. Her interesting inability to remember the words of the ballad: “Nay, that’s not next” (IV.iii.53) has been discussed by, for example, Colleen Ruth Rosenfeld in “Shakespeare’s Nobody” in Othello: The State of the Play, ed. Lena Cowen Orlin (London, Bloomsbury, 2014), pp.257-280. 19 Compare with Brutus’ recourse to this idea of mischief to describe the danger Caesar represents : “And therefore think him as a serpent’s egg/Which, hatched, would, as his kind, grow mischievous…” (Julius Caesar, II.i.32-33). And later, Antony, “Now let it work. Mischief, thou art afoot,/Take thou what course thou wilt!” (III.ii.260-261). 23 For the phrase “Othello music” see the chapter by that name in G. Wilson Knight, The Wheel of Fire: Interpretations of Shakespearian Tragedy (London, Routledge, 1930). 24 Note that Othello says: “I would not my unhoused free condition/Put into circumscription and confine/For the sea’s worth” (I.ii.26-28). 28 Michael Neill, “Othello’s Black Handkerchief: Response to Ian Smith”, Shakespeare Quarterly, 64.1 (Spring, 2013), 26-31; 28. 30 Ben Jonson, Volpone, in David Bevington et al, eds., The Cambridge Edition of the Works of Ben Jonson, Volume 3 (Cambridge, CUP, 2012), p. 88.